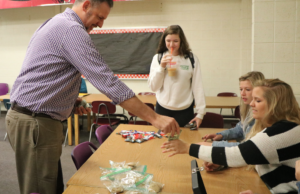 “What do we get if we win?” one student asked during homeroom in response to the canned food drive that Cedar Falls High School and surrounding schools will be participating in through November. This student was thinking of pizza parties or minutes off detention. Win, win, win students are told, and in the midst of the dash, what started out as a pure way of giving back to our community is corrupted into a game with more focus on the givers than the receivers. This honorable service project has been presented as a competition between schools, instead of the excellent service opportunity that it is for students all across Iowa. Don’t get us wrong, we believe the CFHS community is one characterized by generosity and compassion. Another tragedy of these selfish motivations is the inhibitory effect they have on our efforts. For every one dollar the Northeast Iowa Food Bank receives, it is able to distribute $13.31 of food, but because we are competing for pounds of food raised rather than simply contributing much-needed funds, we cannot reap this wonderful opportunity. The Tiger Hi-Line staff fully supports the initiative of the food drive and whole-heartedly believes in the cause of relieving local hunger. We fully offer due thanks to Senior Leadership, Student Senate, Students for Social Responsibility and all other groups and individuals that are contributing to this important cause. What ultimately matters is putting food on the tables of families who otherwise might not have had a meal, but it is troubling that many people are motivated more by rewards than honor. So during this year’s food drive, let’s look beyond prizes and rewards. Let us view this project as a unifying goal between schools and homerooms, not as a competition that produces a winner and a loser. In the end the true winners are those who will receive a warm meal on their tables as a result of our generosity and the unified student community that contributes to this goal. The Board and Staff of the Northeast Iowa Food Bank would like to thank the community for their generous support of the Student Food Drive. We recently came across an article that spoke about the competitive focus of this drive and would like to take this opportunity to respond. 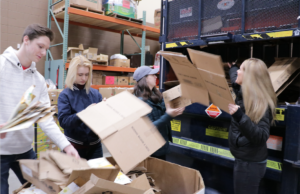 The Northeast Iowa Food Bank was chosen as one of five pilot Food Banks across the United States to implement this project based off of an extremely successful model developed in the Quad Cities. 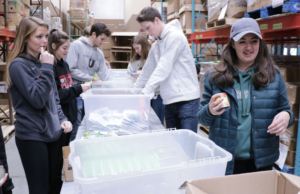 Students in the Quad Cities have taken ownership in this event and have increased the amount of food raised over the past 20 years from 35,000 pounds to over a million pounds! This success would not be possible without a strong student driven effort. We know that our students and the Northeast Iowa community will come together and produce incredible results. This is one of the reasons our Food Bank was chosen to pilot the project; when the Food Bank is in need, the community responds. Last year we reported that, through our member agencies, we are serving 35,700 different individuals annually, 40% of which are children. In order to do this, we rely on broad based community support. We are very grateful for this and cannot operate without it. The Student Food Drive is an excellent way for the Food Bank to engage students from all communities to join together for a great cause. In no way do we want the focus to be on competition, but sometimes a little competition not only adds a little fun, but drives participation and creativity – we have certainly seen this with our eight participating schools and are extremely proud of their efforts thus far. Our goal is to unite students and schools in the fight against hunger. Although there are rewards for all participating schools, this has never been the focus or detracted from the ultimate goal of feeding more people in our communities. It was also mentioned that for every one dollar donated, we can provide $13.31 worth of food to the community. This is correct, and monetary donations are always welcome. However, the Food Bank needs a variety of resources and could not operate without the canned goods and non-perishable items that we obtain through food drives; this product is not typically available in large quantities for us to secure from our national resources. It is a privilege to work and live in a community that is so generous and helps the Food Bank bring in the resources it needs to meet the ever growing demand. As the Student Food Drive continues through Nov. 15, we ask that everyone remain focused on the mission of the drive – “to unite and empower area high school students in the commitment to feed the hungry and to promote volunteerism”. On behalf of those we serve, we thank you. I am writing to you as a response to an article in the Tiger Hi-line regarding the food drive. As I was reading this article I became very offended by the way in which the food drive was portrayed. The term “selfish motivation” really bothered me when referring to the contests related to the food drive. I understand there are contests and some of them have rewards, but that is not all this food drive consists of. This week there have been themes for each of the days, such as fruit day and bring your baby weight in cans. Neither of these consisted of prizes. The themes are just other ways of approaching this food drive to try and motivate as many people in the school as possible. Another reference that was very displeasing about the article was the timing at which it went out. This was written right at the start of the food drive. It seemed to give off the impression that the food drive is being doubted by its own students. Bags for the community were sent out so they could participate in this event too. The bags were sent out on the same day this article was published. It makes me hesitant to believe that everyone in the community will feel motivated to participate now after reading this article, especially if they think it is turning into one big contest. Our goal was to find as many ways as possible to involve everyone in the school and community. We know that our entire community is very diverse and that different activities motivate different people. Our objective was to try and incorporate as many people as we could by offering a variety of different opportunities. Another thing that could be taken as a misconception is that the article was written in the “Our View” section of the paper. This could mislead readers by allowing them to think that this is a majority school opinion of the food drive. I know you mentioned some of the groups involved, but I know for a fact that all of these groups have worked very hard and put in a lot of time to make this food drive successful. All of these groups wanted to plan activities to excited the student body and the community. This article was taken harshly by a lot of the members of those groups and they feel as though their efforts are not being appreciated. I understand the intension of the article was good to make people ware that the primary goal of the food drive is giving back to the community, especially to those who are less fortunate than us. But a member of one of the many groups working hard to make this food drive a success, understand our concerns when these statements are made.